Possibly the first ever television test chart, this very simple pattern was broadcast by the BBC in 1934 using Baird's 30 line TV system. 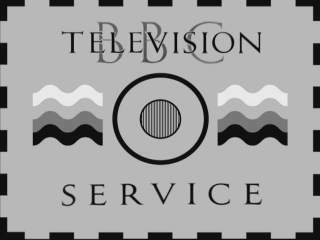 In 1934 and 35, BBC Television had this 'Television Eye" tuning signal, transmitted frequently prior to the few programmes shown. 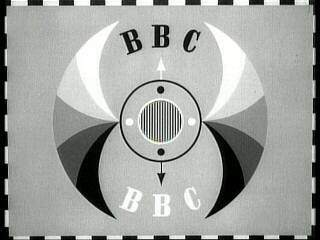 An early BBC Tuning Signal, broadcast before each programme. The idea was to give the old television sets time to warm up, and for the viewer to adjust all of the controls to get a reasonable picture. 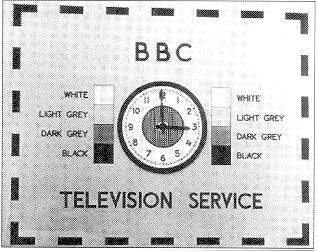 They were not "Test Cards" as such, as they were not designed to test anything, but they were a comforting sight for the early viewers operating somewhat unreliable equipment. 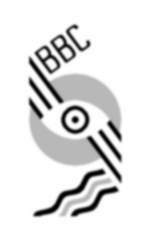 Note the "BBC" logo in computer MICR style, some years before computers were in use. This dates from before the war, around 1937-38. There was at least one other Tuning Signal in this period, sharing a similar design. 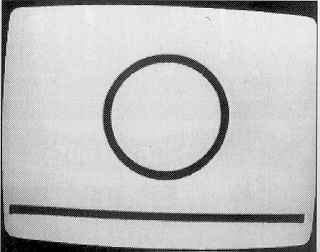 This Tuning Signal heralded the return of the BBC Television Service at the end of the war, first broadcast on June 7th 1946. BBC Tuning Signal from 1949. This was the first to incorporate a clock. Nothing hi-tech, the hands were cardboard and had to be moved manually. It was first trasnmitted on 24th July 1949. Yet another style of Tuning Signal. The centre hole contains a 2.5MHz frequency grating. 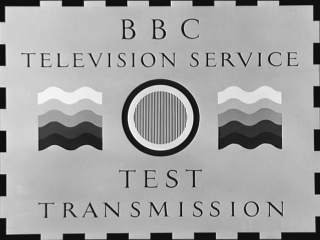 The "Test Transmission" version was usually seen when new transmitters were being set up in the 1950s. Tuning Signal from around 1950, this was the first to be broadcast in 4:3 aspect ratio. The centre hole contains a 2.5MHz frequency grating. The "wavy lines" series was introduced in December 1949. Same Tuning Signal, this time with a clock in the centre. Can anyone confirm exactly when these were shown, and how they were used? Was the one above shown first with the clock version clock reserved for the final minute, or was the clock only used at certain times of the day? Or were these two never shown at the same time? The BBC "Angel Wings" identifier / tuning signal. 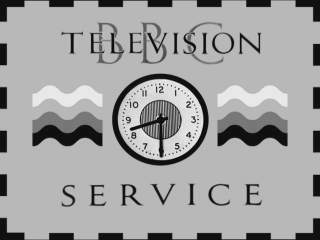 It was introduced in 16th June 1956 and accomapnied by a specially composed tune, the "Television March". That brings us to the end of the BBC Tuning Signals. 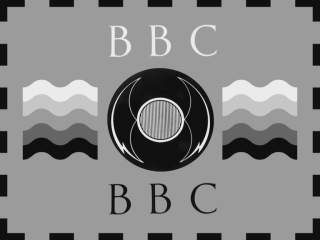 For more pre-programme images, you will need to look at the BBC Test Cards, and the early ident symbols are featured in The Ident Zone. Facts and figures on this page have come from "The First 30 Years of Television Graphics" by Keith Hamer and Garry Smith.